who got hardware who is not working properly. I have to go 9 Mont back, when i observed too that the mini-docks are problematic to connect. Already then, several of us almost got crazy to see /dev/ttyUSB* and to make a serial connection to it. With patient a lot of sacrifice and spending money buying several USB Cables, I am begging onion.io to take some actions now an solve this problem. With the onion1 i could more or less working. I had to plug in out several times the cable till i finally could see /dev/ttyUSB* and connect to it. With Omega2+ and the mini docks I do have no chance to get it working. Because of helping out here in the Forum i got the privilege to choose 3 different docks. With the Ethernet-dock and the big-dock I had chosen then, I was finally able to install a actual firmware (omega2p-v0.1.9-b149.bin). I have chosen b149 because the Repository still is based on that, to avoid any other complications. Reset button is still not working ! no interaction with omega2+ possible (keyboard not response even if i could see the boot log). SSH also not works. How does a 0-8-15 (common) user has to proceed without a alternative to other docks (big&Ethernet) ?? Interaction with Omega and Keyboard not possible. [   11.332749] Driver for 1-wire Dallas network protocol. in System monitor of my LMDE it says the process (there are two) is sleeping. last edited by Ken Conrad @Luciano S.
@Luciano-S. ... Luciano, I agree that the Mini Docks serial connection isn't working with the Omega2s. In fact I posted about it here two weeks ago. My experiences may be a bit different; my year-old Mini docks do work well with Omega1. With Omega2, my PCs receive serial OK, but CANNOT TRANSMIT serial (ie via the RX0 pin) to the Omega2, so I cannot DO anything on the Omega2 with serial communication. A few people responded and basically agreed with my post. Frankly, I am amazed that more didn't say "Me, too", as I have found serial connection to be indispensable to learning and diagnosing (usually self-inflicted) problems in this gear. The difference in how our computers fail to communicate via serial - is this a difference in how Linux handles the lack of a valid PC-to-Dock communication? In my case, Windows 7 seems to tolerate Mini Dock-to-PC without PC-to-Mini Dock communication. Clearly, my issue is not a Windows serial set-up or Putty problem, as this bi-directional communication works fine with my Omega1s, with a direct wired USB UART connection to an Omega2, or with the Omega2s in the Expansion Dock. How is it that all the Mini docks that I received in three orders shipped in early 2016 don't have working serial RX0 with the Omega2? Sure would like to use these Mini Docks .... I am primarily developing for portable and remote uses. I looked at the Onions Mini Dock schematic. I found that our mini docks are not the same as shown in the design - I do not see a 3K resistor from PC TXD to ground on your or my docks ... I believe the purpose of this resistor would be to take a floating signal low. I tried soldering a 3K resistor there, to learn that I can't reliably solder with these tiny components!! In the Mini and Expansion docks I measured and compared the bare (ie without Omegas), USB-cord-powered voltages to ground, to find that the RX0, TX0 and FW RST sockets DO respectively have DIFFERENT voltages. Based on this preliminary testing, I would conclude there is a difference in how the Omega1 and Omega2 communicate via serial RX0 and Tx0, since both work with the 2015 designed Expansion Dock, only the Omega1 (at least with MS Windows) works with the 2015 designed Mini Dock. Again, I challenge anyone reading this to reply that their "Mini Dock (of any vintage) works fine with the Omega2 or Omega2+ via a serial connection" as described here- Terminal connection to Omega via serial . We need these docks and I for one welcome learning how to make it work. I guess you talk about the serial connection freezing? Your flooding of @ characters? I got strange characters once when i tried connect with a wrong speed (omega1). Bricking means "unusable" in sens of software not working anymore. But normally there is a process to fix that. As the omega comes already with a factory firmware not working correctly, and the problem with an incompatible mini-dock, you are not able to fix that. or just wait till someone contacts you from onion.io and gives you an RMA. @Ken-Conrad I just noticed your post and yes, it looks like the mini-dock does not, indeed, match the schematics on Onion's github-repo; on the schematics there are two 3k pull-down resistors on the UART-lines, but I don't even see a 3k resistor at all on the mini-dock in the picture here. I see six 1k resistors and one 10k resistor. That doesn't match any of the schematics. Are there more resistors that aren't visible in the picture? @WereCatf Yes, thanks for reading my post. Luciano's photos of the Mini dock are good and I have the same docks. Yes, there is not a 3K resistor on my docks. Back when I was fussing with them, I was astonished that at direct connection of a UART (3 wires RX, TX and Gnd, if have separate 3V3 power) or four wires from a good 3V3 UART to the Omega2 works fine with bi-directional communication, but these docks fail on the (Omega) RX0 line, every time. That's why I asked what is the hardware fix ... replace the TX and RX 1,000 ohm resistors with 0 ohm or is there another pin in the wrong state? I don't have my notes here, but I think I also found on my working Expansion dock that the TX0 socket is at 0V, on the Mini dock it is ~3.3V - I'll check later to confirm. Could there be something screwy with the beginning state of the onboard UART? I'd guess someone in 2016 did a revision or production change to these Docks. If your Mini dock works please post detailed photos of the top and bottom so we can see if you have a 3,000 ohm resistor or other chips. @WereCatf By the way, I've been meaning to write you about this - In regard to your dock design and since we have these nice photos of the Onion Mini Dock, and assuming that you don't own a Mini Dock ... do take a look at Onion's arrangement of the Type A USB socket, set up so there is ample clearance between it and the bottom of the Omega board - accomplished by using a bit unusual 'low-rider' USB socket with solder pads on the sides and cutting a hole in the circuit board to recess the socket a bit! 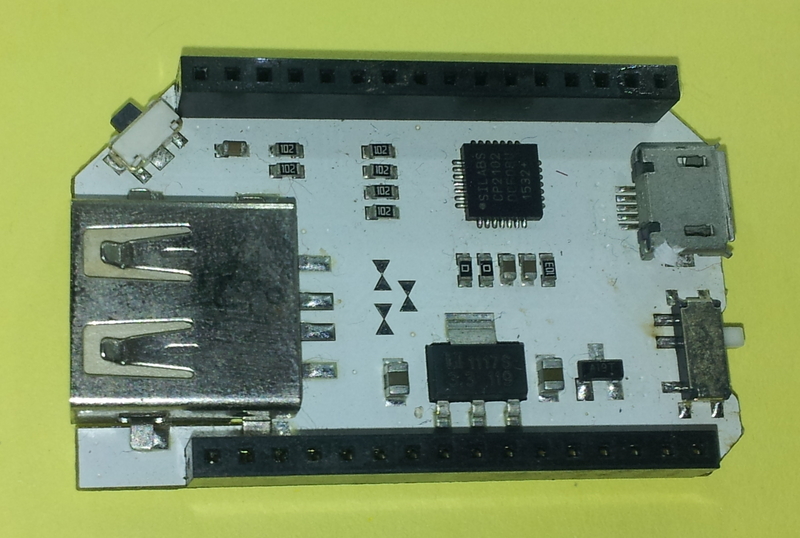 In the case of the Omega2 on your board, is the worst case a standard USB socket grounding out against ... ?